King Abdullah will meet the American President tomorrow. Abdullah Alami has an open letter to Mr. Obama. I find it naïve of Alami to ask Obama to stop the American media from criticizing Saudi Arabia. The American President does not control the American media. Hell, if he had any control over the media he would probably try to stop them from criticizing him. Don’t get me wrong. I hate to see my country being criticized unfairly. But I believe that the best way to stop the others from criticizing us is not by asking them but rather by fixing our issues and solving our problem. Laylah fromt the Blue Abaya blog has some advice to Western women about what they can do in Riyadh to fight boredom and make good use of their time in the capital. She makes some nice suggestions that could be also useful to male expats, and even to some Saudi citizens. The ever-confident Rana has decided to tackle the dilemma of zahma, aka the chronic congestion of Riyadh streets. As calls came in from people telling her their stories of daily horror and misery on the roads, Rana insisted that she wants to hear no whining or complaining. “I want solutions!” she exclaimed in her oh-I’m-so-good-at-this-radio-thing voice. The few calls I had the misfortune to hear offered some pretty innovative suggestions. “Ban all foreigners from driving,” one caller said. “Take old people off the streets,” another one demanded. None of the callers I heard said anything about public transportation. How can a modern city of 6.5m people survive without a public transportation system would probably be a mystery to urban planners for years to come. But fear not, fellow Riyadhians! Arriyadh Development Authority (ADA) got your back. They will make a metro for us, after all. And No, that’s not because they are jealous of Dubai. I mean, seriously, Dubai who? How can anyone compare our historic city to this tiny emirate? The first reaction from officials in Riyadh upon hearing that the Dubai Metro would launch in 9/9/9 9:9:9 was something like: meh. So yeah, Dubai launched their metro with much fanfare. Pretty cool, huh? Well, this is not how we do business in the magic kingdom. The plans for Riyadh Light Transit Railway (LTR) were revealed to Arab News by an unnamed source in the ADA. He gave away some supersecret information about the project, but one little, important detail was missing from the story: when can we expect this new metro to start operating? I suppose ADA don’t have to worry about concealing this tidbit of info, or even falling behind schedule if there is one, because there is no one in charge to make sure that they deliver on their promises on time. What about the municipal council, you may ask. Sorry, they are too busy ensuring that men and women do not mingle during the upcoming Eid celebrations. It has been a year since I wrote about Qaym, the user-generated restaurant reviews website founded by my friend Jihad al-Ammar. I was invited to a press conference last night where Qaym announced launching a new design and new interesting features. Jihad said the website has enjoyed a steady growth over the past year and attracted an active community around it. He then introduced the new design which included a new logo and color theme. No major changes on the interface, but the little tweaks here and there should improve the usability and make it easier for users to find their way around the site. The most important new feature for me is the addition of Google maps to the restaurant pages. Jihad says that it took them a long time and much effort to make it happen, but they are pleased with the how they finally implemented this. Since they only rolled out this feature yesterday not all restaurant pages have them yet, but you can check out this one to see how it is working. Jihad announced during the press conference that Qaym is expanding by adding two new developers to the team: Mashhour al-Debayyan and Omar al-Amoudi, and that they plan to expand Qaym to include reviews for other services and products. A mobile version (and maybe an iPhone app) of the website is scheduled for later this year, he added. I have to say that I’m not just impressed by how far Qaym has evolved, but I’m also extremely proud of Jihad and rest of the Saudi team behind the website. Their hard work and commitment to provide a great service coupled with high quality is to be admired and respected. It is a real shame that they don’t get the recognition they deserve, but I hope that this will change soon. 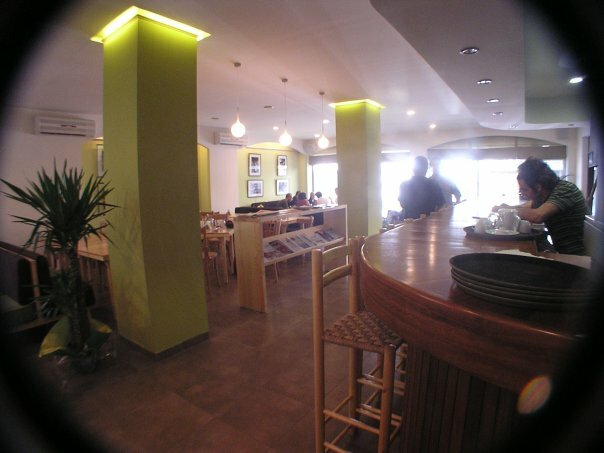 T-Marbouta is a cafe in Beirut that I visited when I was in Lebanon last year. Located in Pavilion St. of Hamra, this place offers something different than what you can usually find in other cafes in the city. With its little library and weekly events and art performances, it has become a favorite a spot for students and young activists. There is this place in Khobar called Otacuschez, which offers a relatively similar experience, but unfortunately there is nothing like that in Riyadh. 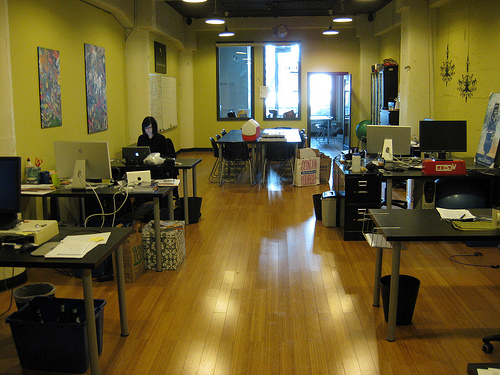 Citizen Space, a coworking space in San Francisco. What is a coworking space? It is basically a cafe-like community/collaboration space for developers, writers and independents. There are many places like these in cities around the world now, and I think it would be great if creative people in Riyadh can have such thing. I mean, let’s face it: this is not exactly a friendly city for writers and artists; a coworking space should be perfect for many of us who seek a healthy, inspiring environment to work and create here. Taken at al-Tazaj, Takhassosi Street, Riyadh.